Solomon Exam Prep is happy to release this month’s edition of “Solomon’s Industry News.” Every month we will send out industry updates from the past month, so you can stay current and up-to-date on everything that is happening here at Solomon Exam Prep and in the industry. Check out this month’s edition here: Solomon’s Industry News – October 2015. Do you need to know about qualified tuition plans, arbitrage rules and LGIP tax-exempt status? Do SMMPs, OMSJs, and “otherwise independent persons” sound meaningful to you? If you answered yes to these questions, then you probably work in the municipal fund securities industry and you need to take the MSRB Series 51 exam. 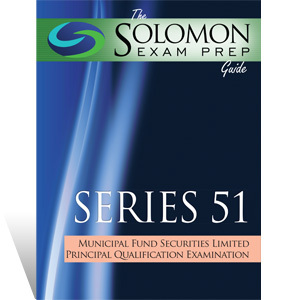 Solomon Exam Prep has helped thousands of financial professionals pass their FINRA, NASAA, and MSRB securities regulatory exams including the Series 6, 7, 24, 26, 27, 28, 51, 52, 53, 55, 62, 63, 65, 66, 79, 82, and 99. 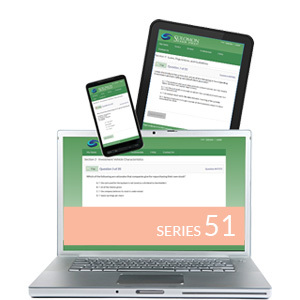 The Solomon Exam Prep training system includes print and digital Exam Study Guides, Online Exam Simulators, Audiobooks, and Video Lectures to address the learning needs of all kinds of test-takers. Solomon Exam Prep is led by founders Jeremy and Karen Solomon, both of whom maintain a lifelong commitment to advancing learning and education. Solomon Exam Prep draws from a pool of seasoned educators, practitioners and communicators who are experienced in both investment education and the process of adult learning. One year ago Solomon Exam Prep published study materials for the MSRB exams. Since publication we have been consistently adding to our material, specifically our Online Exam Simulator database. We are proud to announce that our Online Exam Simulator for the Series 51 has now reached over 1,000 test questions! This means that a student can take 16 full practice exams without seeing a repeat question. This is a huge milestone and one we are proud to share. We are constantly updating and adding to all of our material in an effort to give our students the best chance of passing their exams. 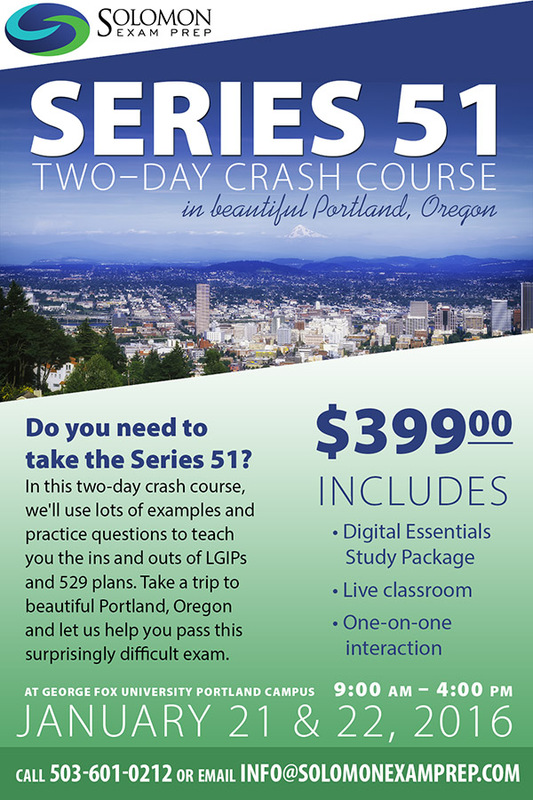 The Series 51 has been a tricky exam, but we have learned a lot over the past year and adjusted our materials accordingly. We are excited to reach this milestone and look forward to reaching many more! Rationale: Bonds are quoted at a flat price, also called a clean price, meaning that accrued interest is not factored into the quotation. Bonds generally trade at a “dirty” price, with accrued interest factored in. Sometimes bonds trade flat, however, meaning that the bond carries no accrued interest. Bonds in default and zero coupon bonds are two examples of bonds that trade flat.